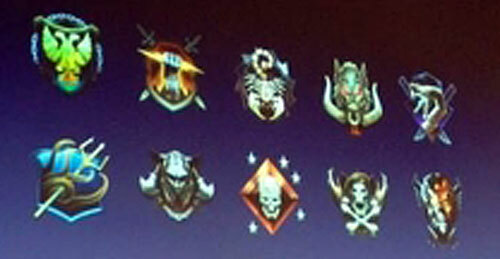 Challenges are used to unlocking "cosmetic content", like emblems and weapon camouflages. Every weapon can be customized. All the weapons in the game have golden camouflages, but they require the player to complete difficult Challenges. Apart from the standard reticles, there are special reticles unlocked via Challenges. For example, "The Steve" is a curly mustache reticle. More than 150 shapes available for you to customize. Designed to be "fun", with not too much grinding involved. 55 ranks with 10 Prestige levels. Weapon experience and unlocks are not reset after Prestige. Prestiging earns you a Prestige Token, like in MW3, that can be used to permanently unlock any weapon/item you want. Extra Custom Class Slot - gives one extra Custom Class Slot, with a maximum of 5 available. Stats Reset - resets everything. Refund - refunds all your unlock tokens. Reaching Prestige Level 10 unlocks everything in the game. 3 teams with 4 players per team or 4 teams with 3 players per team - 3x4 or 4x3. Teams fight against each other like in MW3 Face-Off maps. Hardpoint - works like the typical "King of the Hill" mode. Introduces players to the multiplayer by putting them against humans and AI bots. Boot Camp - Team Deathmatch with the ability to gain experience and rank up to level 10. Mixed teams of AIs and humans. Bot Stomp - Human team vs. AI team. No experience is earned. Objective - Objective-based game modes. Mixed teams of AIs and humans. Allows you to rank up beyond level 10, but you only gain half the experience. Every game mode can be customized. Players have the ability to change any aspect of the game. The Create-A-Class Pick 10 system can be modified to allow players to choose from 3 to 17 items. Weapons and Equipment can be restricted. Don't want Claymores in your matches? Disable them. Scoring mechanics can be modified. AI bots can be used to replace other players.